The project will investigate the production of synthetic methane as a readily exportable, renewable fuel, derived from atmospheric carbon dioxide and hydrogen produced from renewable sources. Carbon dioxide is recovered from ambient air using a liquid absorbent based process that requires heat for the release of carbon dioxide. This heat can be conveniently recovered from the methanation process that converts carbon dioxide and hydrogen into methane. The project will focus on the technology for efficient recovery of carbon dioxide from air and the integration of this process with methane production process. The project will develop liquid absorbent based technologies that recover carbon dioxide from the low concentration levels present in ambient air. This will require innovations in the liquid reagents for carbon dioxide and the gas/liquid contacting devices. 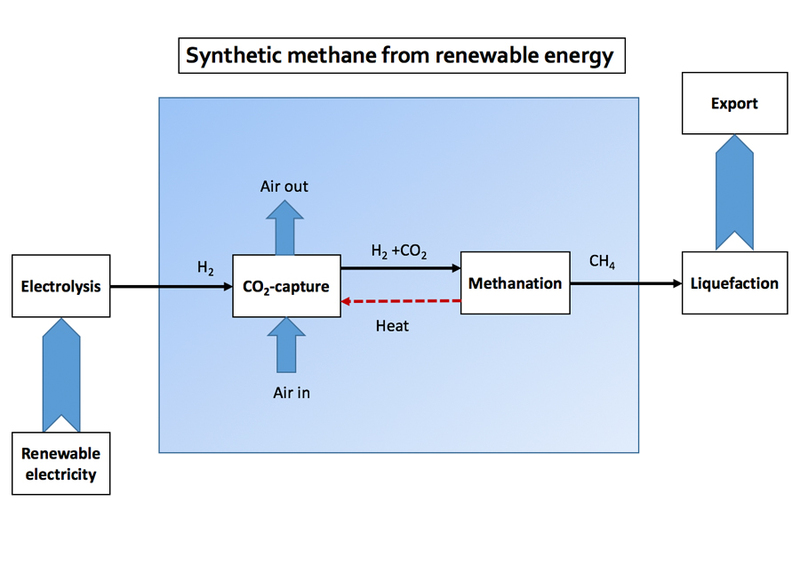 Next, the carbon dioxide recovery process will need to be optimally integrated with the methanation process that produces methane from carbon dioxide and hydrogen. This represents a second area of innovation. The technology development in this project aims to convert hydrogen produced from renewable electricity into a methane product that seamlessly fits in with existing energy export chains and available infrastructure. The carbon source for the process is derived from atmospheric carbon dioxide and is also renewable. A fuel export chain based on liquefaction of renewable methane promises an average efficiency improvement of 100% in comparison to an export chain based on hydrogen liquefaction.